The Compendium of Knowledge is an omnipresent force, an object that has always and will always exist. Lord knows who or what made it, or if it self-created itself, but what we do know is that it contains all knowledge on anything, ever. The Compendium, through its very existence, proves the theory that fiction creates reality. To elaborate, all fictional worlds that have ever been created become recorded in the Compendium and are created elsewhere in Existence. This is proved through the fact that an avatar of The Compendium is always present in every reality, and if so desired, can be edited and change the very nature of the world it's within. Each avatar of The Compendium contains but a fraction of the true Compendium's knowledge: the entire history of the universe in which this avatar resides. All knowledge written in the Compendium is completely and undeniably, the Truth. The Compendium, though it records all of its known existence, is not the pinnacle of Everything. Beyond the existence the Compendium records are higher orders of infinity, extra layers of existence in which higher beings exist who are capable of creating lower orders of infinity such as the one the Compendium records. You are on a higher order of infinity than it. Its author is as well, and they seem to be responsible for writing the reality of the Compendium. 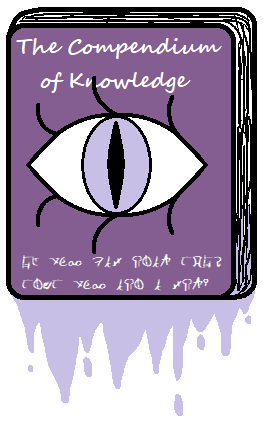 A copy of The Compendium of Knowledge is owned by the various overbeings of each Multiversal Cluster. Welcome, dear Reader, to The Compendium of Knowledge. This is a framework of Existence that I have been working on for a very long time. A book that writes every world into existence and puts fiction and reality on the same level fascinates me. To destroy the concept of what it means to be "real" was my goal, and I have achieved it. The world does not exist for any one purpose and nothing has any particular meaning. We exist to tell an interesting story, and the worlds found throughout The Compendium demonstrate this. Through the most nonsensical means, the many worlds I have created have tied themselves together and become irrevocably intertwined with each other's stories. I hope that you will be so kind as to add your own. Go wild. To get started, view the Topbar and Sidebar and explore the links at your leisure. If you are interested in joining and contributing to the site, please, step into my Library, and begin your journey. I shall be there to welcome you to The Compendium. Generally, pages on this site are created through the use of modules on one of the tabs on the topbar. However, if you would like to make a page that does not fit into any of these categories, you can do so here.